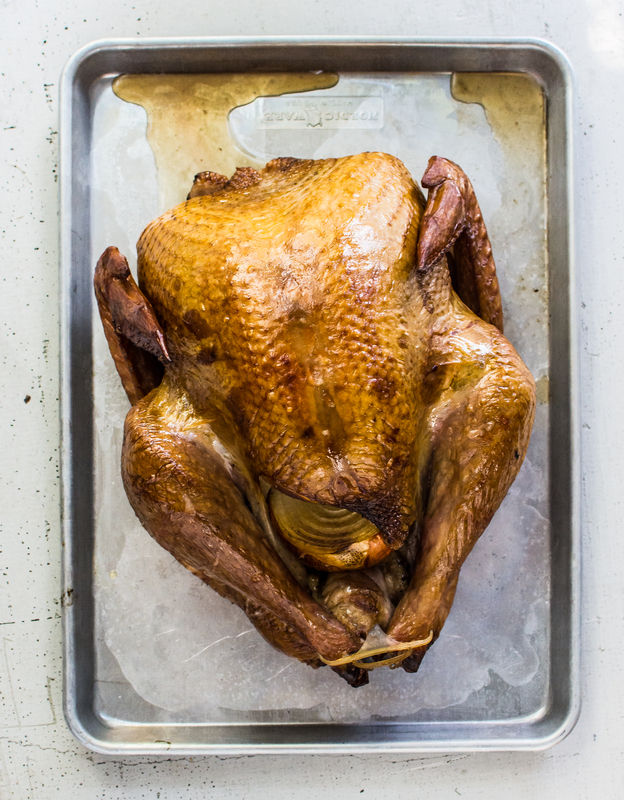 Author note: If you prefer to roast a turkey, follow the steps for this smoked turkey brine and then roast according to this recipe. This recipe was also featured in The Dallas Morning News. Click here to read the story. Remove the turkey from the brine. Pat dry. Set aside. Prepare the grill for indirect cooking at 250 – 275 degrees. Add your preferred smoking wood to the fire while the grill is heating. Stuff the turkey with the peppercorns, herb bundle, garlic and onion. Place the turkey onto the grill. Spray the outside of the turkey with apple juice. Spray the turkey with apple juice once more after 2 hours of smoking. Insert the thermometer into the thickest part of the turkey breast. Close the grill and cook until the temperature reaches between 163-165 degrees, about 4 – 5 hours. Remove the ingredients placed inside the turkey. Carve and serve. Place all ingredients in a large stock pan. Heat the brine until sugar and salt have dissolved, stir occasionally. Remove the brine from the heat and bring to room temperature. Place the turkey in a 32 quart plastic container. Pour the brine over the turkey. Place the turkey into the fridge and let brine for at least 12 hours, up to 24 hours. After the grill has reached the desired temperature, wait at least 30 minutes prior to adding the turkey. 15 pounds of cold mass in the grill can throw off the temperature and may greatly change the cooking time if the grill is not sufficiently heated. Use a drip pan to collect the drippings for a unique addition to your meal. Be careful when incorporating them into sauces or gravy, a little smoke flavor goes a long way. Take a quick peak at the turkey after about 3 hours. If the skin is starting to look done before the thermometer indicates doneness, use some foil to cover those areas to slow the cooking. A gas grill can work just as good as a charcoal one for smoking. Set it up to use half the grill while the meat will reside on the other half. Also grab one of the many products available to house smoking chips or chunks on the grate. This entry was tagged a pleasant little kitchen smoked turkey, dallas food blog, dallas food blogger, easy smoked turkey, how to grill a turkey, smoked turkey, smoked turkey recipe, texas food blog, texas food blogger, Thanksgiving turkey recipe a pleasant little kitchen, turkey recipe. Bookmark the permalink.